The weather here in the South of England is fabulous! Such a rare treat for Easter. Mo's Digital Pencil Challenge is still up and running with the optional theme of "Spring" or you can make anything you like as long as you use a Mo Manning image. 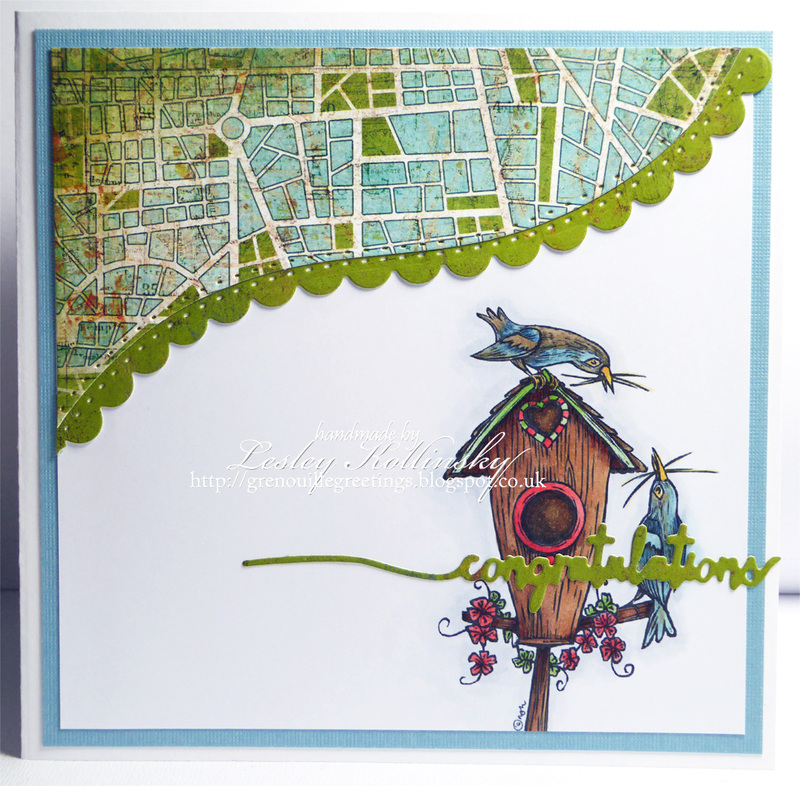 Spring is definitely in the air and the birdies in my garden are busily nest building giving me a perfect opportunity to showcase this card using Basic Grey Papers and Mo's lovely image called "New Nest" which comes with two new home sentiments! 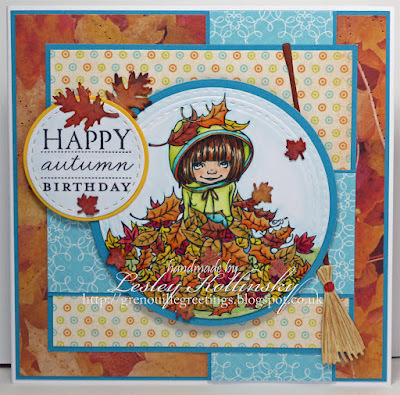 I coloured my image with Copics and used Spellbinder's Borderabilities Curved Dies S5-180 A2 to cut the design paper. I am absolutely determined to do more card making and what better reason could there be than joining in with Mo's Digital Pencil Challenge where it's always "Anything Goes" with the option this month of "Spring". 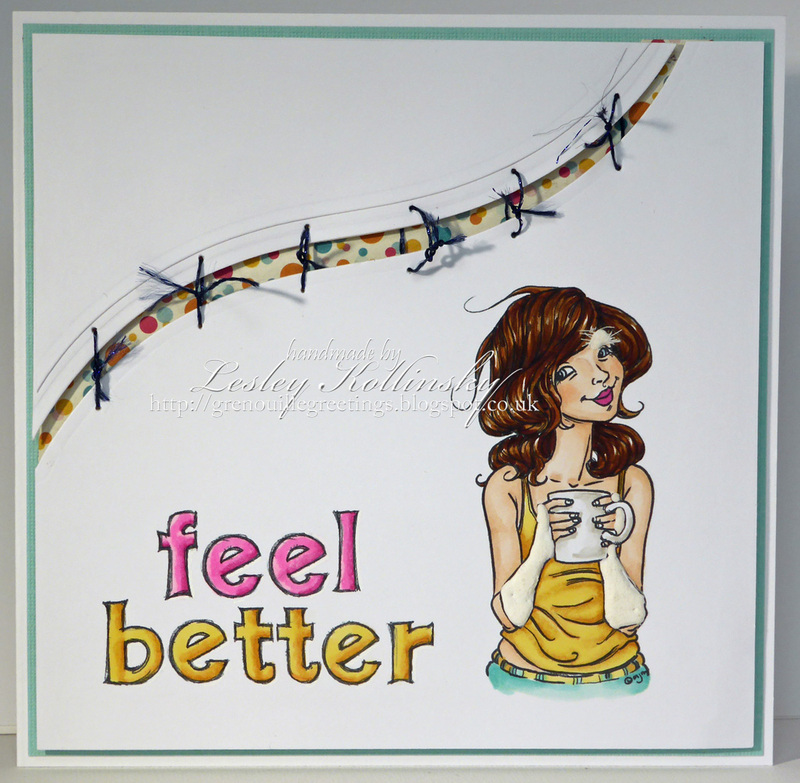 I used Mo's super fun "Feed the Soul" image, coloured in Copics and layered up with some coordinating design papers. What could be more Spring like than a bouquet of tulips! We would love for you to play along with this month's challenge. Mo's Digital Pencil Challenge is back with "Spring"
Mo's Digital Pencil Challenge is back and I was asked if I would like a temporary guest appearance on their design team. I did not need to be asked twice! I LOVE Mo Manning's wonderful images and this coveted opportunity was just the kick start I needed to start blogging again after a two year break. So here is the card I made using Flower Jar from Mo's Digital Pencil which I have coloured with Copics. 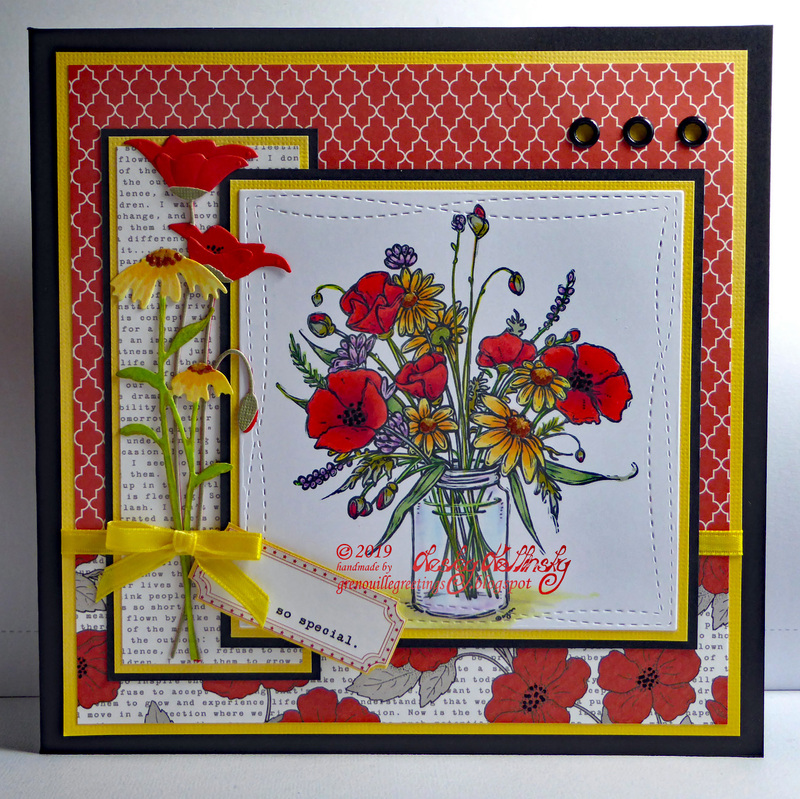 I used some pretty "Stationery Noted" Teresa Collins papers together with a "Wonky Stitched Squares" die by My Favorite Things, "Prim Poppy" die by Memory Box, and Joy!crafts daisy "60030030" die. I would so love it if you would leave me a comment here and then play along with the Challenge this month which is anything goes with the option of "SPRING"! 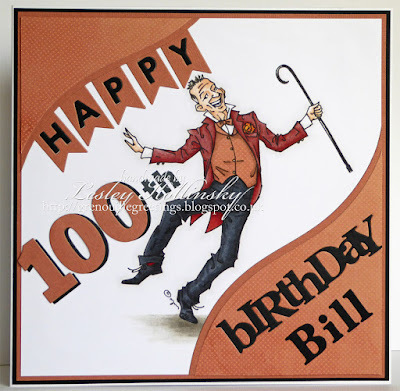 A friend asked me to make a 100th Birthday card for a gentleman who is very well respected in our local community and whereas I don't generally do commissions - I thought that Mo Manning's "He's Still Got It", which you can find here, would be the perfect choice. My image is coloured with Copics. Design papers (including his waistcoat) are 7 Gypsies and My dies are by Papertrey Ink, Spellbinders and Memory Box (I think). I was delighted with how this card turned out and it's relatively CAS for me too! Mo's Digital Pencil DP2 Challenge - Anything Goes with a Mo Manning image. Yesterday was Mother's Day here in my part of the world and my poor Mum has had a rough time these last 2 years. She had been with us for the best part of the last 2 weeks but spent yesterday with my brother and lovely SIL. 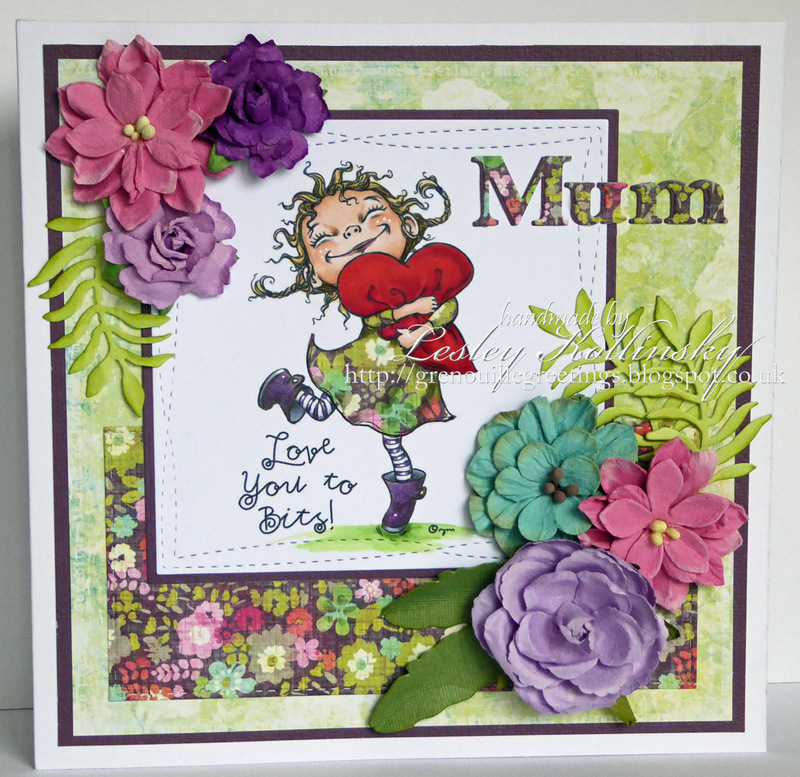 Here is my card for Mum using Mo's absolutely adorable image called "Love You to Bits" which you can find here. I coloured my image with Copics. I'm pretty sure the papers are Basic Grey and Prima, the leaves are from two Stampin Up dies (thanks Nikki) and flowers are a selection from Michaels and Hobbycraft. My lettering is from a Memory Box die. 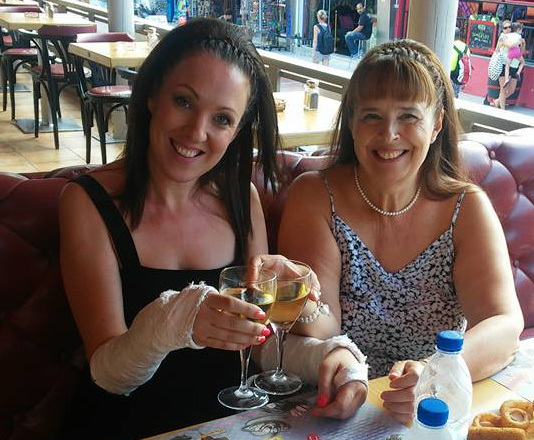 Hope all celebrating Mums had a lovely time yesterday! Anything Goes at Creative Inspirations and Mo's DP2; Any Image at The Ribbon Girl; Flowers Everywhere at Deep Ocean; and More than one die or punch at Simon Says Stamp. OMG! It has been such a long time since I blogged anything I have actually forgotten what to do so I'll keep this short whilst I try to remember. Here is a Valentine's greeting I made for The Hubster using Mo Manning's wonderful Dwarf 2 from Mo's Digital Pencil which you can find here. 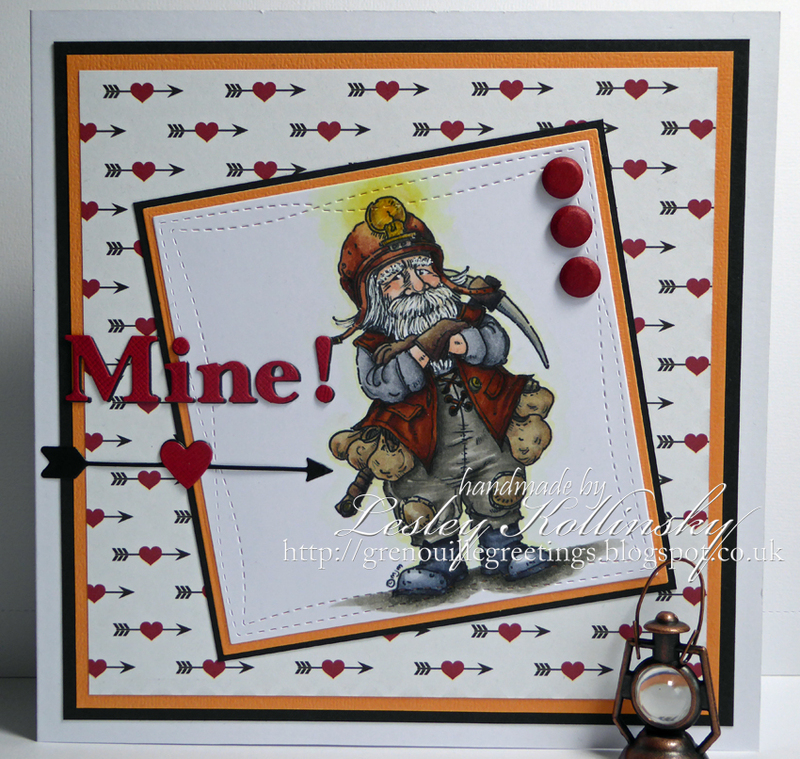 I have been wanting to use this particular Dwarf (there are of course 7 of them to choose from) with this sentiment for a Valentine's Day card ever since I first saw him. I coloured him with Copics, Used Memory Box dies for the lettering, an arrow die and this perfect Glitz design paper. I even managed to find a little lantern in my Spare Parts stash for staging. Labels: Mo Manning "Dwarf 2"
I CANNOT believe it has been so long since I posted a card AGAIN. So to make up for it, I'm entering this one into six challenges. I used DCWV papers from the Citrus Collection and Sweater Weather and teamed them with this gorgeous new image from Mo's Digital Pencil called Lois in the Leaves which you can find here. There is an adorable boy version of this image too if you prefer. My sentiment is by PTI, the straw broom LR0433 is by Marianne Design Creatables and the extra leaves are cut from a variety of punches. My image is coloured in Copics. Mo's DP2 - Anything Goes. T'hubster's eldest daughter fell off a ladder, cut her head open requiring 6 stitches and broke BOTH of her wrists. Mo's Digital Pencil "Coffee" image and the sentiment from "Sick" seemed the perfect combination to send Emma our get well wishes especially seeing as the accident happened just before her birthday and we were unable to be with her to celebrate or to look after her. I used Liquid Applique for the plaster casts and also for the bandage over the eye. I added a little lint to the bandage to make it even more realistic. My "stitches" are hand tied thread with Glitz Unchartered Waters paper beneath the stitching between the Spellbinders curved borders which you can buy here. And here is the poorly bunny in person valiantly attempting to hold a glass of wine on her birthday. Her doctor's stitches were much neater than mine and thankfully had been removed by the time of Em's birthday. 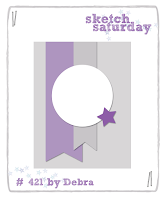 I am entering my card into the challenges at The Ribbon Girl for "Any Image" and Less is More for "thread", together with "Anything Goes" at Deep Ocean and Simon Says Stamp. 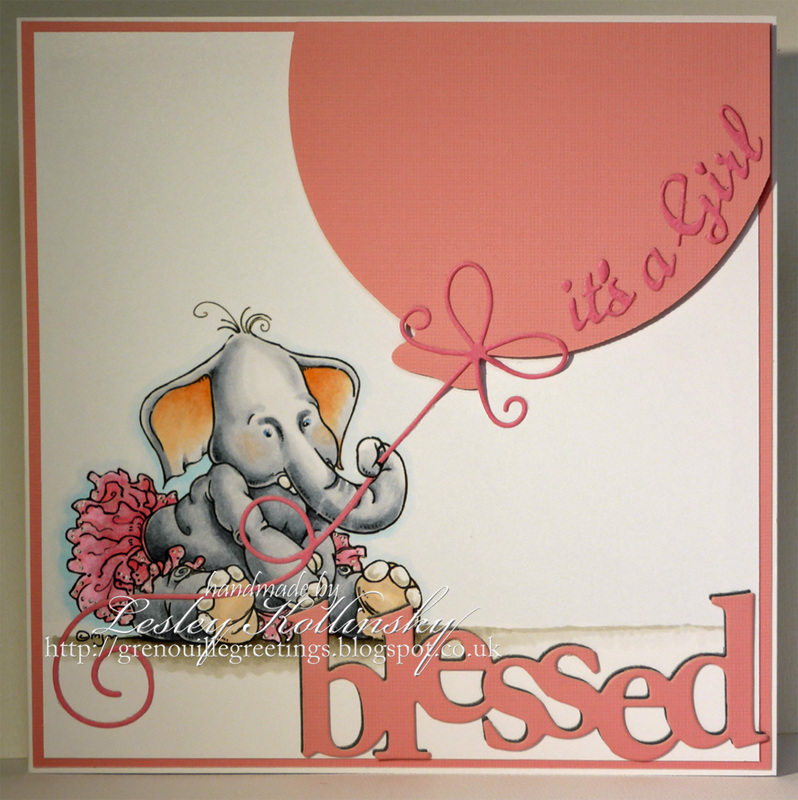 I needed a card for a baby girl and I opted again to use one of Mo Manning's gorgeous images. 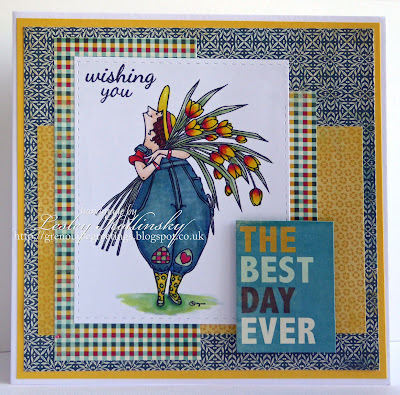 I used "I heart you" which is available as a digi stamp from Mo's store here and also in rubber by Stamping Bella. I asked Mo if she minded if I replaced her lovely heart-shaped drawn balloon with a paper one and she said it was okay. 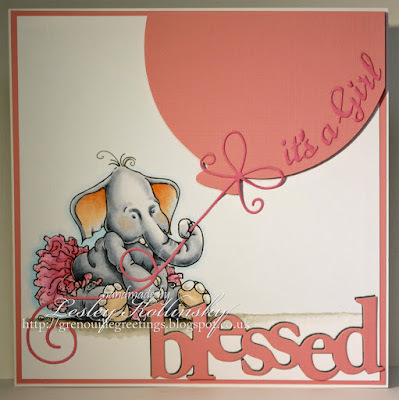 I cut the balloon on my Cricut, used Presscut dies for the "it's a girl" and Memory Box dies for the bow, string and "blessed". I hadn't thought of using blessed when I made last week's "it's a boy" card (see full post below). I like how these different elephants look as a pair and they would be great to merge for boy and girl twins. I am entering my card in the anything goes with a Mo's image challenge at Mo's Digital Pencil. 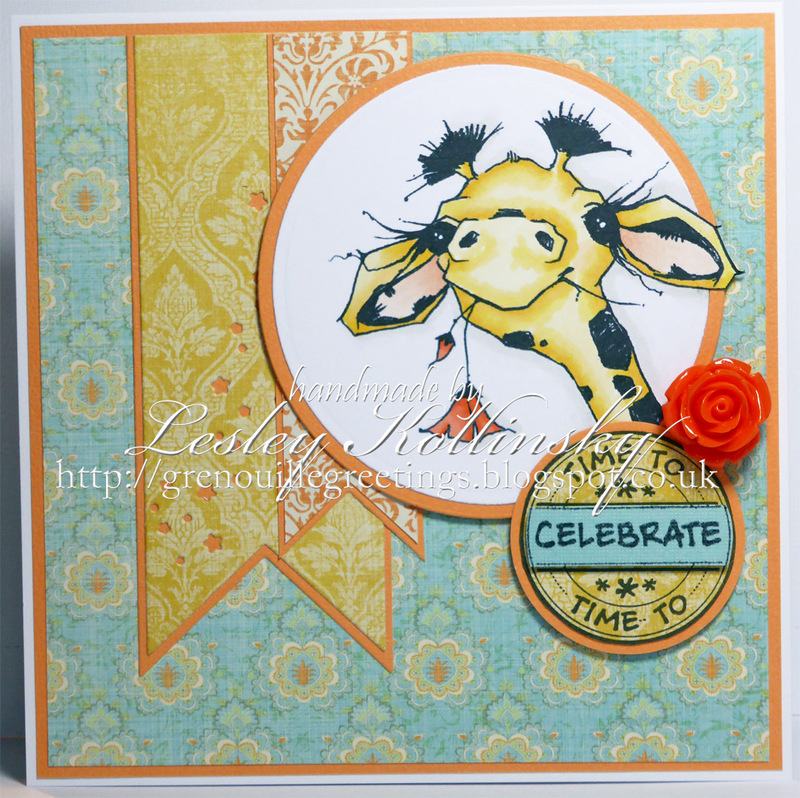 Simon Says want to see stamping and Sweet Stampin' want something cute and cuddly. 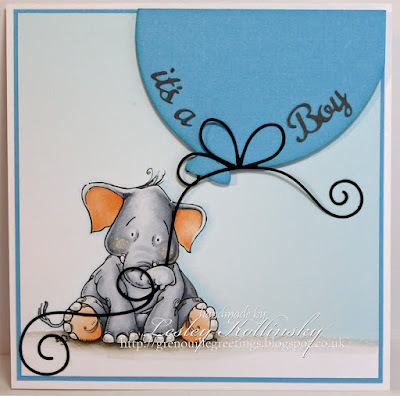 I realise elephants aren't the most obvious choice for the Sweet Stampin challenge but this one is a baby elephant and there is no denying how cute she is! Labels: Mo Manning "I heart you"
Goodness me, now that I'm not on the Sketch Saturday design team any more, I keep forgetting to post anything on my blog. 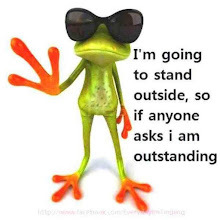 I am, however, being quite creative. The lovely Mo Manning of Mo's Digital Pencil has been drawing the most fabulous new images virtually on a daily basis and seeing (and buying) them every day has given my personal "Mo"-Jo a real boost. I've even done some (not much - but some) essential tidying in my Craft Croft in between making cards. Now I just have to get active with Facebook and Blogging. 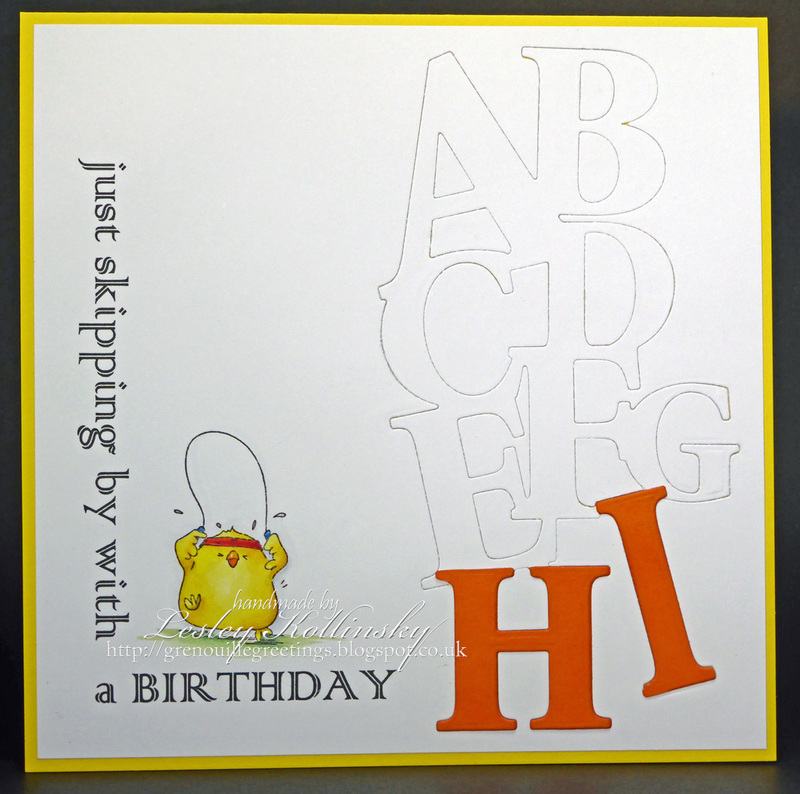 For my card today I used Mo's adorable "I forgot" which you can buy here. 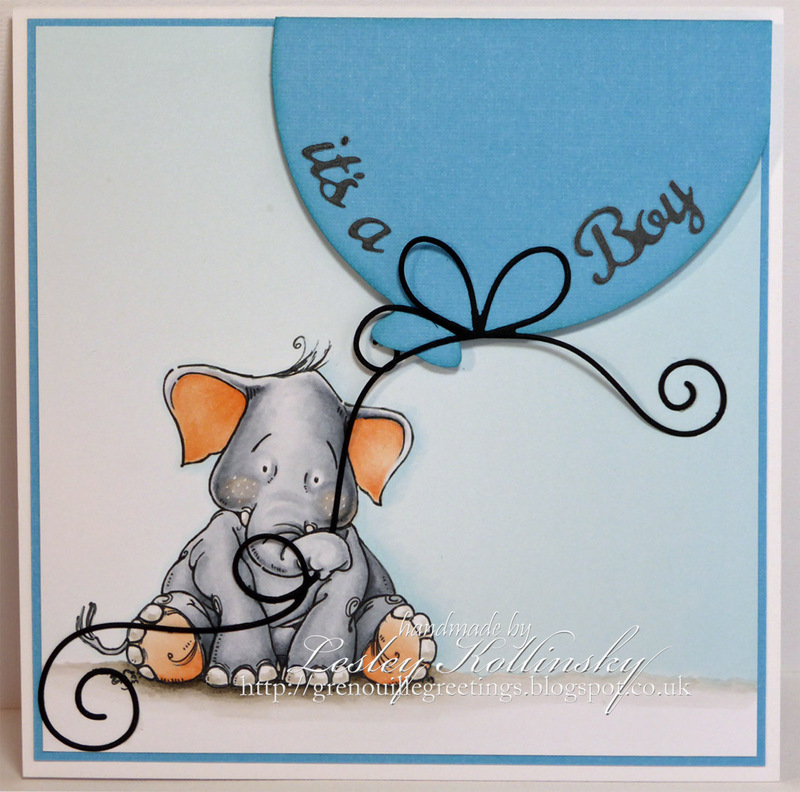 A dear friend has taken a shine to elephants as a theme for her new baby and this gave me an idea for a baby card. In the original image, the elephant is holding a flower but I asked Mo if she minded if I swapped the flower for an over-sized paper balloon and she very kindly agreed. I cut the balloon with my Cricut and the balloon string is a Memory Box die. The elephant is coloured with Copics. Aud Sentiments, Ribbon Girl & ABC (where O is for Open) and also Cute Card Thursday who want to see animals and Stamping Sensations who have asked for One for the Boys. Labels: Mo Manning "I forgot"
Some lovely friends have become engaged. They happen to be very fond of daisies and I made them a card using this Papertrey Ink One Liners die as a sentiment on which to ground (and dangle) my minimalist design elements. I used an oversized embossing folder for the polkadots and I cut the daisies with a variety of punches and topped them with Craftworks Candy and little pearls. 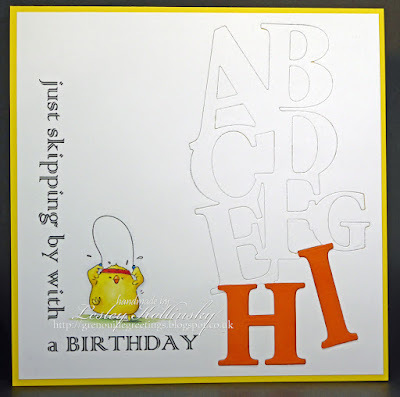 The tiny tag punch from Stampin Up is one of my faves! 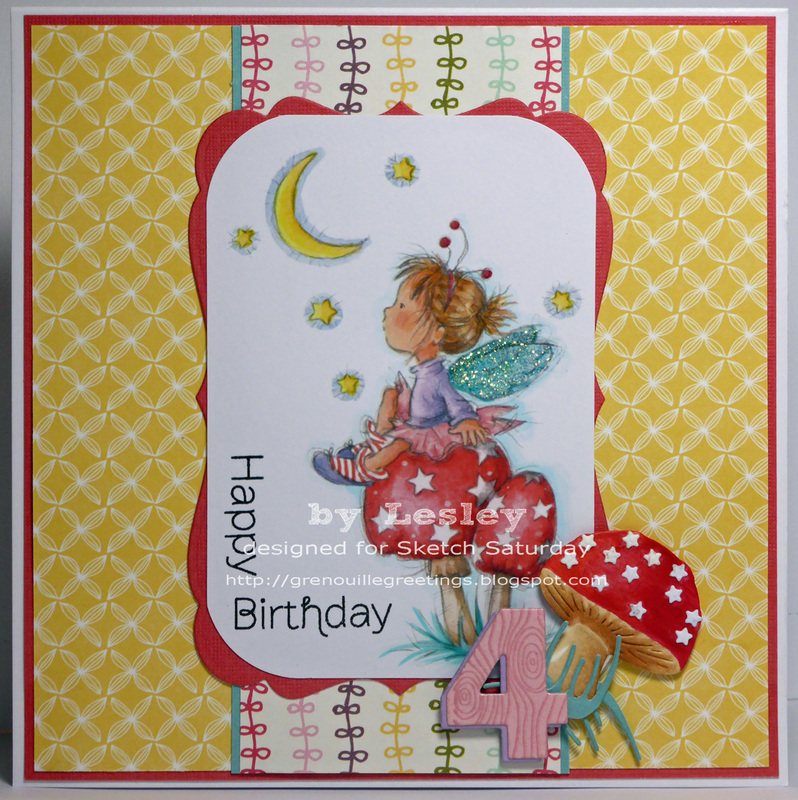 I am entering my card into the challenges at Papertrey Ink Make it Monday who are showcasing stamped grounded sentiments, Simon Says - Fabulous Florals and Bunny Zoe's Crafts - Summer Florals. I wish my photograph was better quality! I decided to try out a slightly different style (for me) with this card. When I saw this Poppy Stamps Jumbled Alpha die (which you can buy here at Dies to Die for), my eyes saw A B C D E F G H I, but my brain really only saw the last two letters. Then I bought a cute Stamping Bella stamp called Sweaty Chicks and masking off the other two chicks, I used only this little guy with a Word Processed sentiment. I cut the white letters out using the die and then popped them back in. The orange ones are stuck on top but next time I shall insert them for a flat finish. 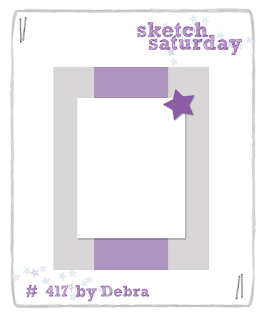 It's unlike me to make a card with so much white space but I rather like it. This is only my second posting since I left the lovely Sketch Saturday team and I miss them so much I thought I would play along with their sketch this week. I used this adorable image from A Day for Daisies called "Hello Baby Giraffe" which you can find here with my favourite Theresa Collins papers and a cute little flower embellishment. I've coloured my image in Copics and I realised I have taken a terrible photograph. I'm sure my colouring looked better IRL! Hey ho! The sentiment is by LOTV and I have used some Papertrey Ink banner dies too. ADFD where I have CASEd the colours of this pretty card by their teamie, Juliana; and the "Any image" challenge at The Ribbon Girl. My Mother has been poorly of late. After a brief spell in hospital and another stay at my house she is back in her own home and that seemed a good enough reason to make her a card. Maurie Manning of Mo's Digital Pencil produced gorgeous new images recently with Fathers' Day in mind of a child holding a card for Daddy but, after a special request from me, she was kind enough to provide the same image holding a card for Mummy and that is what I have used here 4 Mummy Girl S. I am so grateful, Mo. Thank you!!! You can find all of Mo's lovely images on this theme which include a boy and a girl and a choice of straight or curly hair for each here. 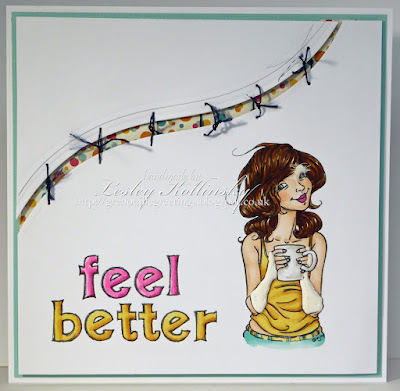 In addition to Mo's lovely image which is coloured in Copics and paper pieced, I used "Felicity" papers by Glitz and a Wonky Stitched die from MFT Die-namics, a Marianne die and a Stampin Up "hello". My flowers are by Recollections. 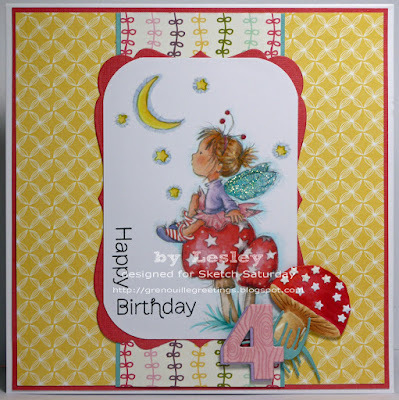 This week I made a card for one of my two lovely great nieces using a precoloured LOTV image which I overcoloured a little to make brighter and combined with this perfect mushroom die LR0372 from Marianne Designs Creatables. The number four is a Die-namics die and the stars on the mushroom are cutouts from a Papertrey Ink banner.